A short demo of how the basic edition of MetaModelAgent can improve your UML modeling environment without the need of any customization. 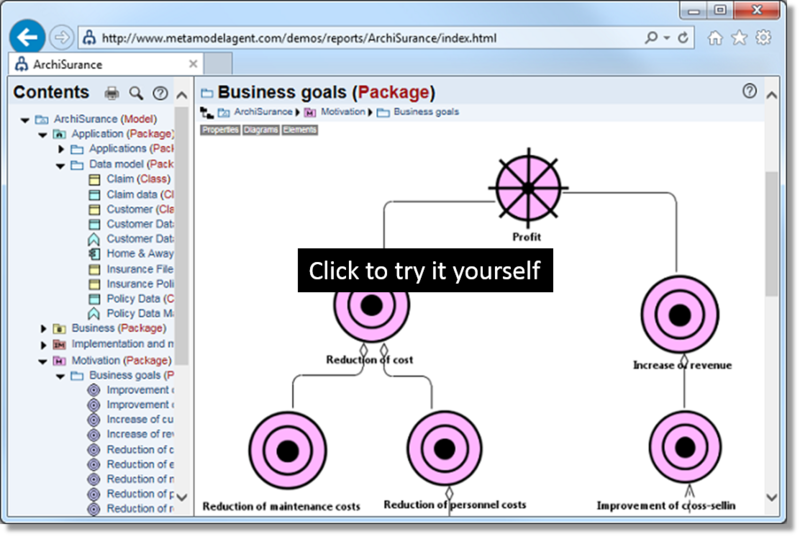 This demo is captured using MetaModelAgent v4.1.3 for IBM Rational Software Architect but exactly the same functionality is available for Papyrus. A short demo of how the standard edition of MetaModelAgent can provide a customized modeling tool for your own domain-specific modeling guidelines. 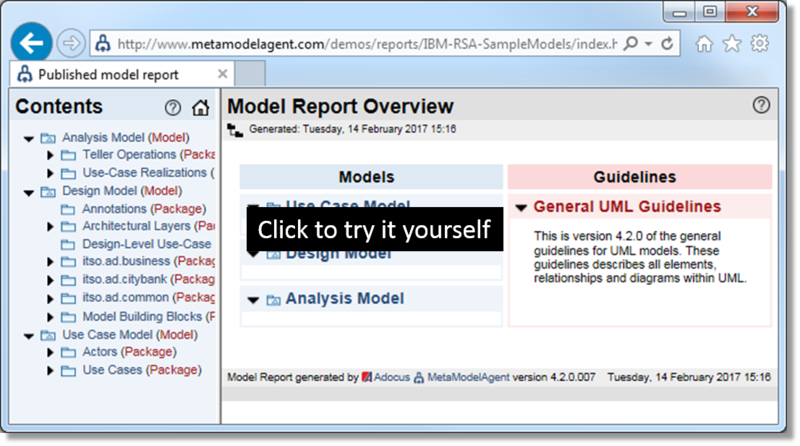 This demo is captured using MetaModelAgent v4.1.3 for Papyrus but exactly the same functionality is available for IBM RSA. 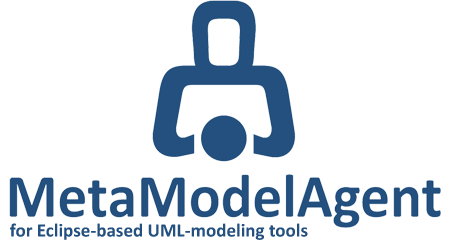 MetaModelAgent provides a very powerful web publisher that will let you generate your models and guidelines as a comprehensive easy-to-navigate web site. The generated web site can be made available for anyone without access to the modeling tool, without any additional licenses needed. Below you find an example of a generated web sites based on a simple example model and example guidelines, which will opens in a new browser window. This is a very simple example of information model guidelines and an information model of some different kind of vehicles developed in Papyrus. This example does not make use of any UML-profile at all, only standard UML-elements without extensions are used. 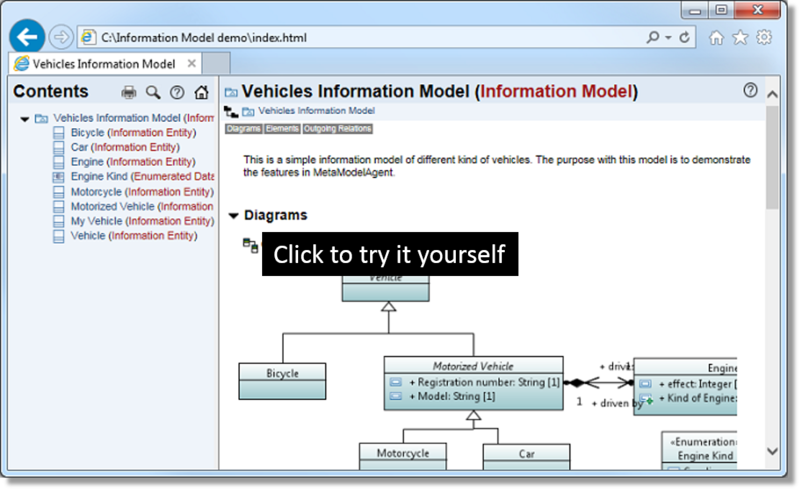 Published Papyrus Information Model Example with associated guidelines for Information Modeling. This is example of some simple traditional UML models provided by IBM as sample models in RSA. These models make use of the general UML guidelines that comes with MetaModelAgent. Published traditional UML models with the usage of MetaModelAgent´s built-in General UML Guidelines. This is example of a simple ArchiMate model using the ArchiMate extension to Papyrus. This model make use of the general UML guidelines that comes with MetaModelAgent. Published ArchiMate model with the usage of MetaModelAgent´s built-in General UML Guidelines. To open the metamodels included in the zip-files you must have MetaModelAgent installed as they refer to the MetaModelAgent UML-profile for metamodels. To tryout the MetaModelAgent functionality on the included models, you must have at least a FREE MetaModelAgent license available. To download and install the MetaModelAgent software and requesting a license key, please see Get Started. All provided models and metamodels are license free for any kind of usage and modifications. The zip-file contains an Eclipse-project with a complete example of a metamodel for very simple information modeling and a small information model example. Please see enclosed Readme file for details.